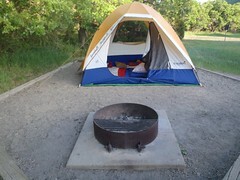 At Mesa Verde National Park we stayed in the tent area of the Morefield Campground. 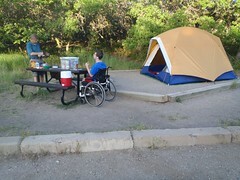 The campsites are not very good accessibility wise, but that's tent camping. You get to choose your spot, so you can go around and find the one that seems best for you. Note that a good number have steps up to the site. They all have raised packed dirt pads where tents must be set up. Most sites also have a picnic table, but none of them are wheelchair accessible. This is kind of annoying when they actually have wheelchair accessible picnic tables that are very obvious when you drive by the group camping area. Mik could sit at the end of the table and set stuff on the table, but he could not roll under enough for it to be very useful for eating. The bathrooms near the tent site do not have accessible stalls, but there are some in the RV areas that at least on the map are marked wheelchair accessible. Also, they have nice companion style ones up by the camp store and restaurant. The restaurant has a nice pancake breakfast that we ended up enjoying on Sunday morning. 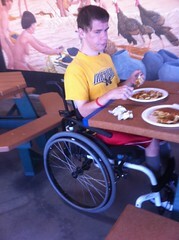 Mik loved the pancakes and bacon, as well as the fact that they had wheelchair accessible picnic tables to eat at. Morefield Campground certainly is anything special, but it is not much different than some of the KOAs accessibility wise. It is definitely convenient for visiting the attractions at the National Park. The best part is the price. Not only was is much cheaper than KOA at its regular price, but we actually only paid $25 total for 2 nights because we got 50% off with Mik's Golden Access Card. Make sure you tell them you have the card and have it ready to show at check in. I had put it on the notes when I made the reservation online and paid the first night deposit. The guy did not notice it at first and I forgot about the discount and paid for the second night at check in. He then noticed and right away refunded the second night charge since our deposit paid for the full stay.